There have been warnings that armed struggle could once again begin to fill the political vacuum following two incidents in Fermanagh and Belfast involving the breakaway IRA groups. 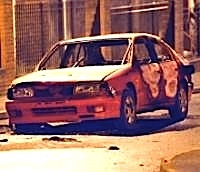 A short while after making their escape, a small explosion occurred inside the abandoned vehicle, setting it alight. The PSNI police later said the car contained up to 400 pounds of home-made explosive which had failed to detonate. Gerry Kelly, a Sinn Fein minister in the power-sharing Executive said huge damage could have been caused. “We’re very very lucky that it only partially exploded,” he said. He condemned the bomb attempt as “unacceptable”. Speaking to reporters, he said it was “ironic” that the Policing Board was attacked “which is the very accountability mechanism which was negotiated and set up to keep the police to account”. “If this attack is the work of one of the small republican militarist groupings then my message to them is very clear. These actions are futile and have no place in advancing republican or democratic objectives. These activities need to end,” he said. On the same night, on the very western end of the Six Counties, there was an exchange of gunshots in the village of Garrison, on the Fermanagh border with County Leitrim in the 26 Counties. The PSNI said they had “returned fire” and successfully prevented a planned gun attack. Reports have varied on the number of shots fired, but no injuries were reported. Four men were subsequently arrested in the area, the PSNI said. Another man was subsequently arrested in County Leitrim. The attacks followed heightened levels of police oppression of dissident political leaders in the North, including the arrest of spokespersons for the 32 County Sovereignty Committee and the Republican Network for Unity. According to one report, the list of republican dissidents under surveillance in Belfast has grown three-fold in the last eight weeks, with hundreds of republicans now under permanent watch across the Six Counties. They also come as a long-running political stalemate appears set to continue through the Christmas period. The annual conference of the DUP at the weekend focussed on the return of unionist majority rule in the Six Counties, with still no indication of a date for the transfer of policing and justice powers from London to Belfast. Today [Monday], tensions continued with what the PSNI described as an “elaborate” hoax attack in Armagh. The courthouse in the town was cordoned off while a British Army bomb disposal team examined a device. SDLP policing board member Alex Attwood said the breakaway armed groups were now posing a higher level of threat. “All the evidence over the last number of months confirms that this appears to be growing,” he said. But Mr Attwood insisted the police and its institutions have been “the most resilient” over the last decade. PSNI Chief Matt Baggott said the British government was putting substantial resources into “investigating and thwarting” the republican armed groups.